I’m Elisabeth, the Green Party candidate for the Forest Gate North by election. Here’s my manifesto for Forest Gate. I will push the council to take the banks to court to get £millions back for Newham residents. Newham council was mis-sold bank loans amounting to over £500m, and the pay-back terms on these loans are so high that 80% of our council tax is now going to pay them off. That’s £51m a year – just over the amount the council is suffering in budget cuts from central government. If elected, I’d make it a priority to encourage Newham council to take the banks to court to get our money back. With this money coming back to the council rather than to the banks, we’ll be able to invest in better waste collection, council housing, sure start centres, cycle routes and community centres across Newham. Please sign my petition asking Newham council to take the banks to court. I will seek to improve the current recycling contract and challenge the £20 bulky waste fee. Rubbish on the streets is a major problem in Newham. Despite this, the council have decided to charge residents £20 for each bulky waste collection. This will just make things worse. If elected I would challenge the council to take this charge away and set up new pilot schemes to tackle flytipping in Forest Gate. Not only that, Newham has one of the worst recycling schemes in the country. If elected, I’d seek to end the current recycling contract and get a new one in place that can collect food waste, more plastic items, tetra paks and glass. I will fight for more social housing and oppose estate demolition if residents want to stay. Somewhere good to live is a basic human right and a world leading city like London can afford to offer that to our citizens. However, Newham’s housing is in crisis. Local people are being priced out of the area and rogue landlords are charging rip-off rents while allowing tenants to live in damp, crowded conditions. Social housing tenants are being forced out of their homes, making the problem worse. If elected, I’d oppose the demolition of council housing schemes that residents love, such as the Carpenters Estate, and work with local residents to resist evictions. I’d push to make sure that any new development offers a majority of social and genuinely affordable housing as standard. I will work to reduce pollution and increase investment in safe cycling and pedestrian infrastructure. Newham has some of the worst air quality in the capital, and schemes such as the proposed Silvertown tunnel will only attract more cars into our borough. That’s the last thing we need! I’d oppose this unnecessary development and encourage the council to invest in better cycling and walking facilities instead (such as the London Cycling Campaign’s plan for Upton Lane and Woodgrange Road). This would give us cleaner air to breathe and we’d have fewer traffic jams. I’d also push to get bike hangars for Forest Gate’s residential areas, which provide parking spaces for 6 bikes in half a regular parking space. Your Green Candidate for Forest Gate North! Hi, I’m Elisabeth, and I’m the Green Party candidate for Forest Gate North. I live on Sebert Road under the Goblin line, having decided to move here when I fell in love with Wanstead Flats four years ago. Forest Gate has been my home for a relatively short time, and yet I feel more a part of the community here than I have anywhere else since I moved out of my parents’ house. I guess it’s that kind of place. In my professional life I’m an environmental campaigner (in the above photo I’m handing in a petition against plastic microbeads to Number 10!). I’ve led successful campaigns to create marine reserves in far flung corners of the world, getting to know island communities and working with them to protect their incredible underwater life. I also helped to achieve a reversal of government proposals to water down the National Curriculum’s requirement to teach children about nature. My degree in psychology and my experience in environmental campaigning have given me the skills to understand how to tackle issues like flytipping, one of the most pervasive problems that this area faces. The recent decision to introduce a £20 charge to collect bulky items seems to me to be a big step in the wrong direction, and shows a real misunderstanding of local people’s circumstances. You might have met me when I worked at Coffee7 a couple of years ago. While talking to other people who live here, I’ve heard that many are deeply dissatisfied with the current council and Mayor. No matter what your political allegiance, it’s surely bad for democracy to have only one Party represented on our council, with no opposition to scrutinise their decisions. In the last local elections here in 2014, the Green Party came second in Forest Gate North. If you want to send a strong message to the council, increase the democracy and accountability of the council, and elect a candidate who will listen to residents and fight hard for their concerns, then please consider voting Green on 14th July. Author ElisabethWhitebreadPosted on June 20, 2016 July 5, 2016 Categories Council electionsTags Democracy, Green Party, London, Newham, Newham Council, West HamLeave a comment on Your Green Candidate for Forest Gate North! Hello. My name is Rachel Collinson and I’m a recovering tacti-holic. Four years I skidded along in the surface of politics. I used to vote Labour to keep the Tories out. I dabbled a bit with donating. I did every petition around. Then when that didn’t work, I looked around for some harder stuff. I spoiled my ballot. I voted Lib Dem to get the Greens in. That was when I hit rock bottom. I thought things were never going to change and sank into deep political apathy. Then one day a friend told me about tacti-holics anonymous. I finally looked up and saw the vote for policies site. The scales fell from my eyes. I realised I could no longer live that lifestyle, and decided to vote for what I actually believed in. It’s like a new lease of life. No more holding my nose. I know that I’m building a new movement, that things can change. And Greece is proof of just how quickly they can change! Here’s what they don’t tell you about this. There’s an interesting secret the establishment don’t want you to know about. They’d rather you stay a slave to tacti-holism, going to more extreme lengths to prop up a broken system. The secret is: Short Money. What’s that? Well, exactly. Provided a party has one MP (which the Green Party does) and over 150,000 votes overall (which we got last time) then that party is eligible for Short Money. More votes mean more money. Over the last five years, this has provided Caroline Lucas MP with the assistance to introduce a stream of brilliant private members bills and amendments on the things we all want: an end to exploitation of slaves, railways back in public ownership, reinstating the NHS, closing tax loopholes and more. My name is Rachel Collinson, and I am a recovering tacti-holic. 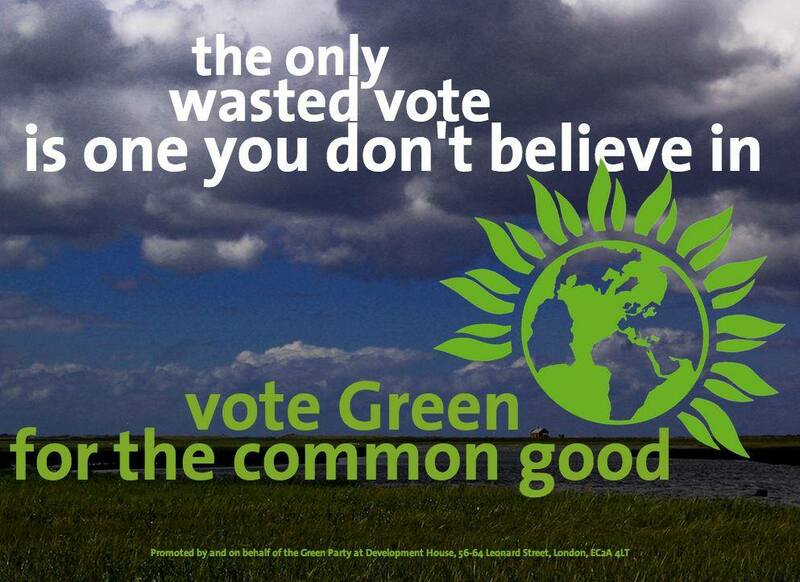 A green vote is never a wasted vote. 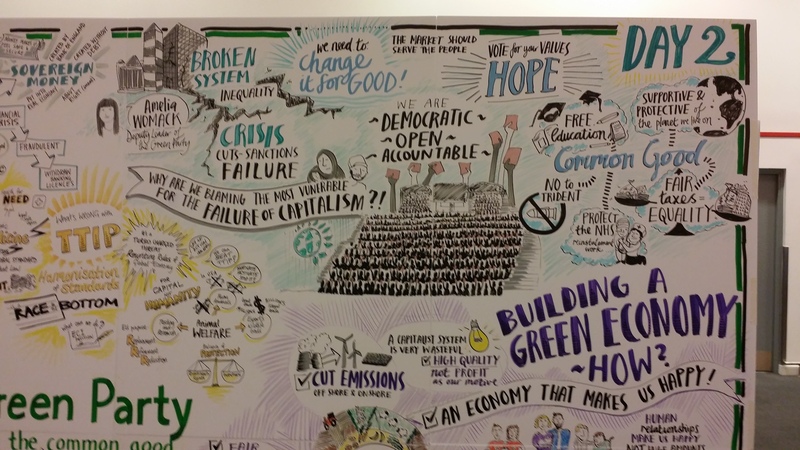 This blogpost was written by Newham Green Party member Rachel Collinson who recently ventured up to Liverpool to participate in her first Green Party conference. Here is her take on Green politics in action. Forget what you read in the snide newspaper reports about smells or rights for rodents or colouring in or magic: the gathering. Preposterous lies! I can tell you this, because I was there. As you might expect from the Greens; here is the real news – the facts the establishment don’t want you to know. This is the only main UK party conference where YOU, the member, get to set and vote on policy. It is true democracy. And it was thrilling to be able to raise my voting card, along with the 1,300 other people there. One of the things I voted on, heart pounding, was what the Green Party’s response would be to potential coalition negotiations in the event of a hung parliament. The result? A resounding NO to any agreement containing austerity policies. The Greens would only join a confidence and supply agreement if part of it including a commitment to increasing spending on the poor and taxing the super-rich to pay for it. I am proud to say that voting on this felt like part of making history. Seeing the care and attention paid to including everybody. And I mean everybody, from parents with young children, to non-members, to those angrily opposed, to non-binary gender folks, to the working class, to people with limited mobility; even waiting for a person with a stutter to make their contribution during a tense debate. And even those described by the Telegraph as the frizzy-haired do-gooders, like me. Thanks, Telegraph. Remind me: which hair care brands are paying the wages of your journalists?